Who says the sharing of love and appreciation has to end on February 14? At CDS, a trio of fifth graders made sure everyone felt the love well past Valentine’s Day. For the second year in a row, Avery W., Rachel C., and Saaya A. decided they wanted to give a hug to every staff and faculty member at CDS. Inspired by the 2018 Big Hug event (held at Tropicana Stadium), the girls started their Hug-A-Thon with the elementary school on Valentine’s Day. They continued the hugging after the long Presidents’ Day Weekend, concluding with the middle and upper schools, as well as athletics and administration, on February 20. Prior to the Hug-A-Thon, this excited trio shared their plans with each of the division heads, then came up with a hugging schedule. They even were brave enough to speak at the upper school assembly on Tuesday, February 19, where they shared their idea with the upper school students as part of the kindness challenge. “We wanted to let our teachers and the staff at CDS know how much we appreciate them every day,” explain the girls. 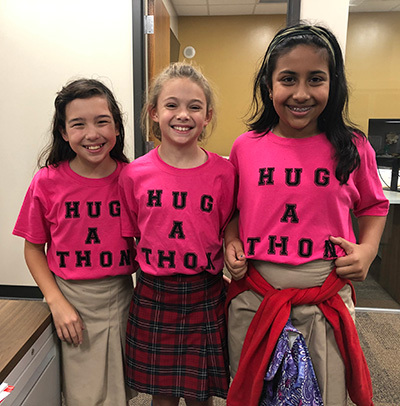 “They do so much for us and this is our way of saying ‘thank you’.” By the end of the Hug-A-Thon, the girls hugged more than 115 elementary, middle and upper school staff and faculty members, surpassing last year’s number and this year’s goal! Sounds like just another perfect day of love and friendship at CDS!